This page is dedicated to information about the implementation of the FDA’s new regulations under the federal Food Safety Modernization Act (FSMA). For history on the statute and regulations, see the action alerts and updates posted on our federal food safety page. 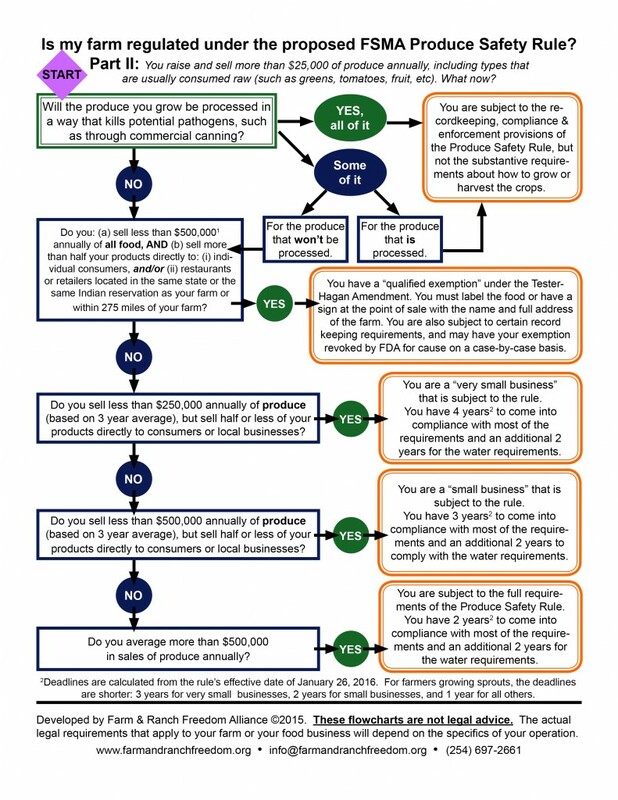 We created the flowcharts below to help you determine whether or not you are exempt from the FSMA regulations. For those who are not exempt, we have partnered with Texas Organic Farmers and Gardeners Association to conduct compliance workshops during our annual Conference and elsewhere. Check our Events Listing to find out if there is a workshop scheduled near you. 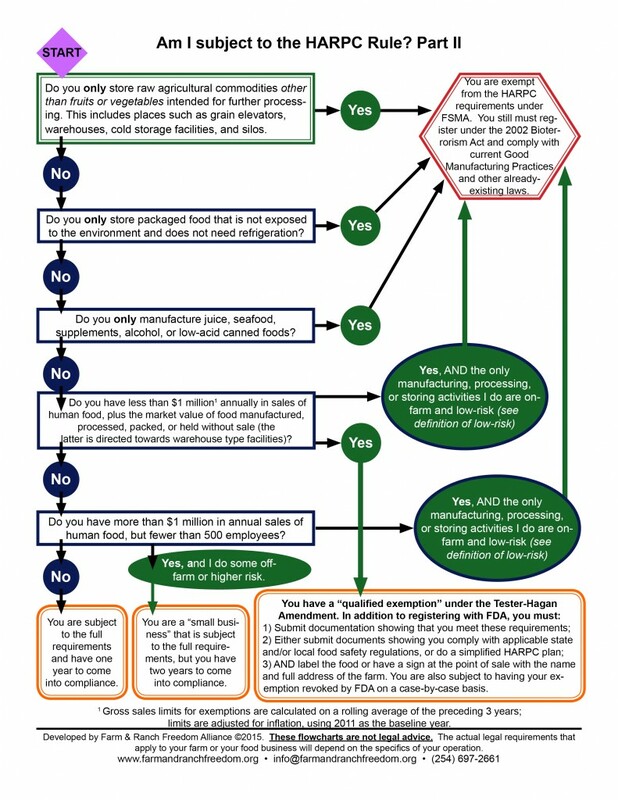 Do the FSMA rules apply to me? Download a pdf version of the flow charts here. 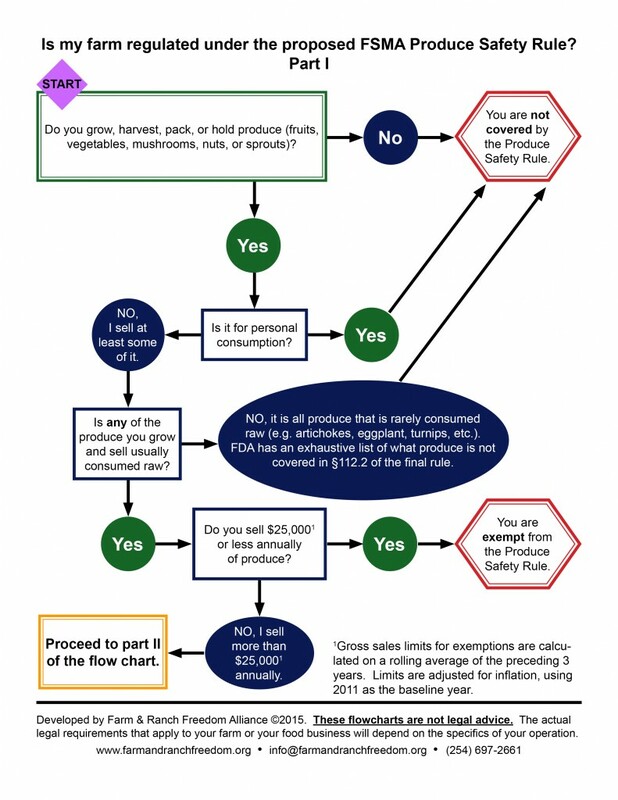 These flowcharts cover two of the main rules under FSMA: the Produce Safety Rule and the Facilities (HARPC) Rule for Human Food. We are in the process of creating a chart for the Facilities Rule for Animal Food. 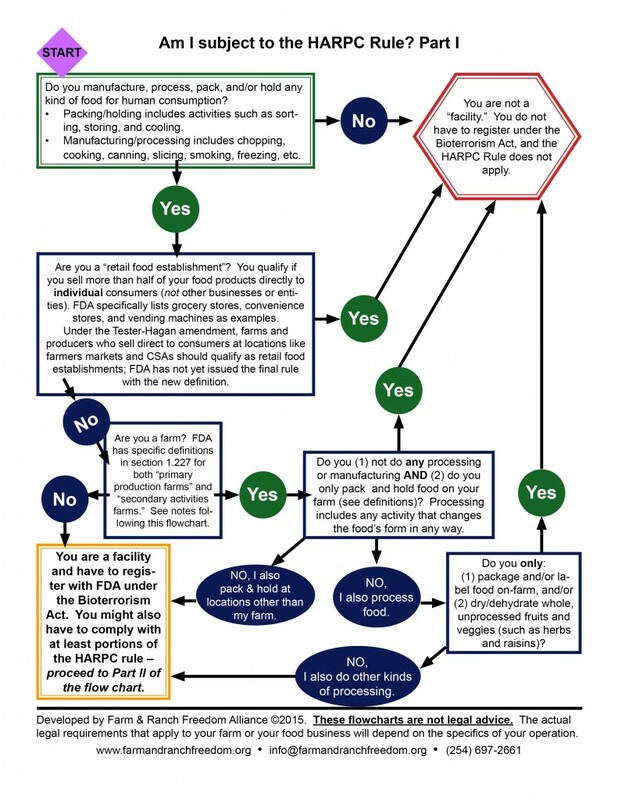 Remember that FSMA includes other provisions that may impact your farm or food business – these flowcharts cover only the two main rules, not every aspect. These flowcharts are not legal advice. The actual legal requirements that apply to your farm or your food business will depend on the specifics of your operation. We encourage you to consult with an attorney on any questions you may have about your farm or food business. Start with Part I of each flowchart. If Part I indicates that the rule may apply to you, then go to Part II to learn more. These flow charts only address the applicability of the rule – i.e. whether or not a type of farm or food business is subject to the new regulatory provisions. The Farm and Ranch Freedom Alliance is working on guidance to help farmers and food businesses that are subject to the rules to understand what is required.